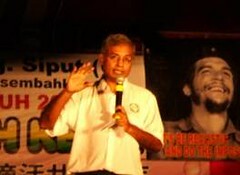 The landslide victory by Justice Party leader Anwar Ibrahim in the August 26 Permatang Pauh by-election is welcomed in this commentary by Dr Jeyakumar Devaraj, the first federal parliamentarian of the Socialist Party of Malaysia (PSM), as a "marker of the massive change" and another development that will open up democratic space in Malaysia. The by-election results in Permatang Pauh, a semi-rural constituency in the northern state of Penang, is yet another marker of the massive change that is taking place in Malaysian politics. Usually by-elections are won handsomely by the Barisan National (BN) government because the BN will approve millions of ringgit in development projects, deploy all its main leaders in the campaign and use the subservient media to the fullest. This was attempted in Permatang Pauh this time around. From ASAP, August 1, 2008 -- Dr Mohd Nasir Hashim, Socialist Party of Malaysia (PSM) president and state assemblyperson for Kota Damansara in Selangor, expressed his hopes to the Uncensored talk show host Francis Paul Siah on Malaysiakini.tv last week. "There's so much work to be done'', he exclaims, reiterating his common theme of ``working for the people'' in the 30-minute show. First on his to-do list: "Damage control" and assuaging the economic plight of the poor. However, while he's ``glad to meet with the ordinary people", Nasir also wants the people to know that he expects them to "jointly work on solutions" with him. "I don't want dependency on me or politics for every want", he said. "Maybe 50% with me, 50% somewhere else." June 21, 2008 -- The National Front (BN) government led by PM Abdullah Badawi has been shaky since the March general election that returned a much stronger parliamentary opposition — now largely united in a new People’s Front (Pakatan Rakyat). However, the BN’s recent decision to lift petrol prices by 41% (and diesel by 63%) has galvanised a new round of mass protests. Thousands took to the streets in Kuala Lumpur after prayers at the mosque on June 13 demanding that prices be lowered and a much larger rally is being planned for July 6. Link’s Peter Boyle spoke on June 19 with S.Arutchelvan, the secretary-general of the Socialist Party of Malaysia (PSM), about the recent developments. After a 10-year battle for registration as a legal party, the PSM has just been promised recognition by the embattled government. This follows the PSM winning two seats in the March elections. Port Dickson, Malaysia, June 1, 2008 -- The Socialist Party of Malaysia (PSM -- Parti Sosialis Malaysia) successfully concluded its 10th congress at a time when the ruling Barisan Nasional Party faces its biggest threat to its survival in Malaysian politics and while capitalism faces its biggest challenge -- the world food crisis. It is an exciting time and it is time for change. The PSM's successful three-day (May 30-June 1) national congress was attended by around 150 people, including delegates from seven states, three front organisations and invited guests who have been strong supporters of PSM for the past years. The congress was held at the National Union of Banking Employees (NUBE) centre, Port Dickson. The road leading to NUBE was decorated in red. Banners greeted the delegates. [The PSM is] the vibrant and only remaining socialist party in Malaysia... [This congress marked] 10 years of uncompromising politics -- to uphold class politics against communal politics, to advance the working-class agenda against the ruling capitalist class. Ten years of survival without legal political registration. DILI, May 1, 2008 -- A May Day rally attended by some 700 workers organised by the Trade Union Confederation of Timor Leste demanded the implementation of labour laws, just wages that comply with the minimum wage regulations and lowering of prices. Demonstrators consisted of workers from several companies in Dili, students and civil society activists. The Luta Hamutuk Institute sent along its members to participate also. April 18, 2008 -- There have been dramatic developments in Malaysia since the ruling National Front (Barisan Nasional – BN) government had its majority in parliament reduced sharply in general elections on March 8. Opposition parties, which won five out of 13 state governments, formed a new People’s Alliance (Pakatan Rakyat) on April 1. Police disrupted a large opposition rally on April 14 to mark the end of the government’s five year ban on opposition leader Anwar Ibrahim participating in politics. Anwar claimed at the rally he now has enough defections from government MPs to form a federal government but will not make the move until he increases his majority. At this stage, the People's Alliance comprises the Justice Party (Parti Keadilan – PKR), the Islamic Party (PAS) and the Democratic Action Party (DAP). 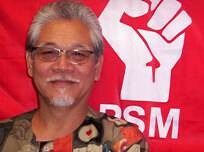 Interview with PSM leader S. Arutchelvan, PSM secretary-general, conducted by Peter Boyle. The Socialist Party of Malaysia (PSM) won two of the four seats it contested in the general elections on March 8. Dr Jeyakumar, a central committee member of the PSM defeated a senior leaders of the ruling Barisan Nasional, Minister of Works Samy Vellu, in the seat of Sungai Siput in Perak. Last August I visited Sungai Siput with Jeyakumar and other PSM comrades. Their strong base among plantation workers (mostly descendants of indentured labourers brought from India in the British colonial era) was very obvious. PSM president Dr Nasir Hashim won the state Legislative Assemby seat of Kota Damansara in Selangor. “Today is a great day for all Malaysian opposition parties including PSM”, declared the party’s website.